Environmental Management Systems (EMSs) are a way in which business and industry can implement a system of self-regulation on their processes, in order to aid the promotion of clean technology. This book brings together wide ranging analysis and practical experience on Environmental Management Systems and Cleaner Production. This highlights the importance of a clear understanding of complex environmental issues and the relative impact of business and industry, linked to national and international standards and regulations, in developing an efficient Environmental Management System. The book begins by addressing the global dimension of EMSs and Cleaner Production by identifying the strategies and policies used to promote cleaner production in industry and the drivers for voluntary EMSs like the international standard ISO 14001; and their implications for business and trade. This is followed by focusing on selected national perspectives, examining the policies, strategies and initiatives in the USA, Sweden, China, Hong Kong, New Zealand and Australia. The relative merits of regulation or self-regulation are also explored, including the UK situation and the EU s Eco-management and audit schemes (EMAS), and associated certification and accreditation schemes. 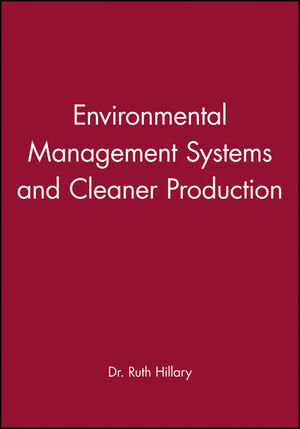 The second half of the book covers industrial experience of EMSs, such as the British standard BS 7750, and case studies of cleaner production; drawing on practical sector experience and company case studies from Europe, the economies of South America and South Africa, Central and Eastern Europe, and small and medium-sized enterprises (SMEs). This book will prove to be an invaluable guide for business managers tackling EMSs and practitioners involved in cleaner production. It will also be a useful reference for local and regional government officials, policymakers and Environmental Management post-graduates. Dr. Ruth Hillary is the editor of Environmental Management Systems and Cleaner Production, published by Wiley. Drivers for International Integrated Environmental Management (J.Wolfe). The Possibility of Cleaner Production Worldwide (S. de Hoo). Management Systems: Getting Lean, Getting Green in the USA (J.Atcheson). Environmental Management Initiatives in China to Promote CleanerProduction (Y. Zhuang). The Role of Regulatory Systems in Requiring Cleaner Processes andRelationships with Voluntary Systems (A. Duncan). Cleaner Production Through Environmental Management of ProcessInnovations (N. Thorsen). INDUSTRIAL EXPERIENCE FROM EMERGING AND TRANSITION ECONOMIES. The Greening of Lithuanian Industry: Past and Present (L.Rinkevicius). PRACTICAL CASE STUDIES FROM SMALLER COMPANIES. EMAS Adoption by an SME in the Chemical Sector (V. Biondi & M.Frey).